Posted October 15, 2018 by William Martin & filed under News. 45 years after its first appearance, The Rocky Horror Show begins a new national tour later this year. The cult musical extravaganza’s new 12-month tour starts at Theatre Royal in Brighton on Thursday 13th December, running at the theatre until Saturday 5th January before heading out nationwide. Buy tickets at atgtickets.com/brighton or by phoning 0844 871 7650. 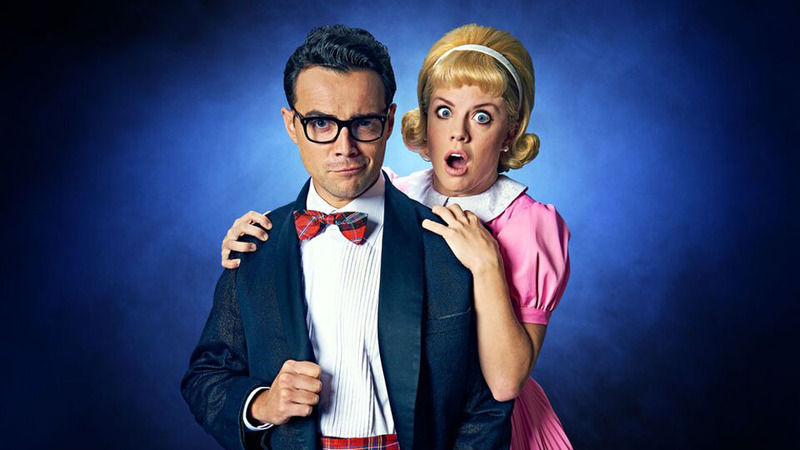 The cast includes Strictly Come Dancing champion Joanne Clifton as Janet, Ben Adams from ’90s boyband A1 as Brad, and West End star Stephen Webb as Frank, with Kristian Lavercombe returning to the role of Riff Raff. As ever, audience participation is encouraged, starting with getting dressed in the most outrageous fancy dress! Richard O’Brien’s sci-fi horror comedy musical tells the story of Brad and his fiancée Janet, two squeaky clean college kids who meet Dr Frank’n’Furter by chance when their car breaks down outside his house whilst on their way to visit their former college professor. It’s an adventure they’ll never forget, with fun, frolics, frocks, and frivolity, bursting with timeless songs and outrageous outfits. The Rocky Horror Show has been performed worldwide for nearly half a century now, in more than 30 countries and translated into over 20 languages. Win ‘The Rocky Horror Picture Show’ party pack and Blu-ray!